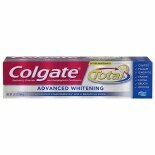 Shop Colgate Total Anticavity Fluoride and Antigingivitis Toothpaste Gel (5.8 oz. )5.8 oz. 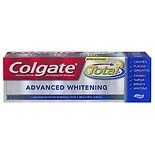 Shop Colgate Total Advanced Whitening Toothpaste (4 oz. )4 oz. Shop Colgate Total Anticavity Fluoride and Antigingivitis Toothpaste Gel Fresh Mint (7.8 oz. )7.8 oz. $429$4 and 29 cents$0.55 / oz. 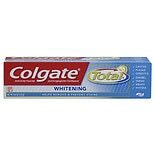 Shop Colgate Total Anticavity Fluoride and Antigingivitis Whitening Toothpaste (6 oz. )6 oz. $339$3 and 39 cents$0.57 / oz.